Oh, thanks for all your sweet studio love yesterday! It's fun to share it, and definitely fun to be in right now. I added a few notes to the Flickr photoset with some details if you were looking for that. Exhibit A. 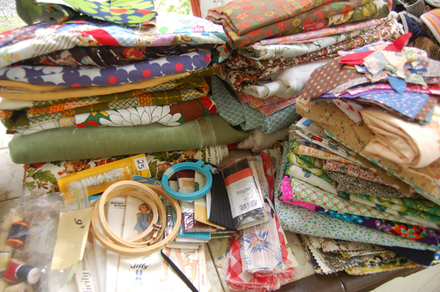 My sweet little bundles of newly purchased vintage fabric and goods. Exhibit B. 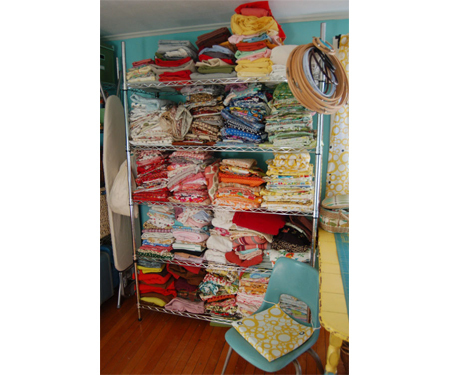 My sweet rack of neatly stacked FULL fabric shelves. You see? The new stuff has nowhere to go. A conundrum, I tell you. A conundrum I'm happy to live with. But a conundrum nonetheless. 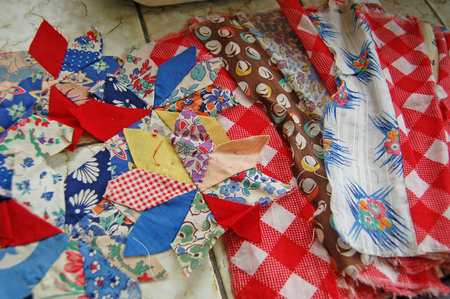 Anyway...my favorite bits from the sale were these quilt pieces. I can't stop picking up these unfinished pieces - I love them so. 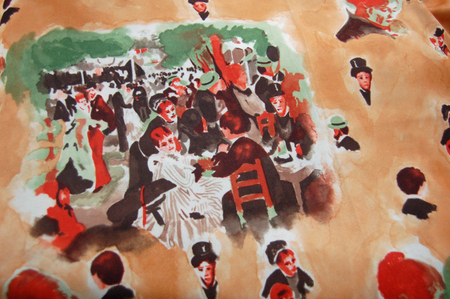 Some of the fabrics here make me slightly out-of-breath. That brown with the dots? yeah, that one. Oh my. One more random observation from waiting in line at the fabric sale, watching the women around me and remembering my own grandfather's presence there before he passed away: I've decided that the ultimate sign of a good partner would be one that, at the age of 75, will drive the other one to such a sale as this, set up the lawnchair with coffee for the long waiting line, wait patiently for said shopper (crossword and coffee in the car, perhaps?...or sweetie, the Big Jab, a latte and sudoku? ), and then drive right up to the entrance to pick her and all of her fabric goodness up to go home. I was feeling all nervous that this never made it into our wedding vows, so as soon as I spoke to Steve after the sale, I asked if he'd do this. Thankfully, he said, 'okay, sounds fun'. I ignored all sarcasm, and felt much relief.